All the magic of Christmas comes alive when Santa Claus gets ready for his trip. On Christmas Eve Santa travels all over the world on a sleigh pulled by reindeer and delivers toys to children. YARAT Contemporary Art Space invites you to enjoy unique event dedicated to our beloved character. The project will be presented at ARTIM Project Space on January 25. During the event Camping Azerbaijan will inform guests about the project. An exhibition of talented photographers Zaur Mirzayev, Elshan Baba, Eldar Akbarov will open as part of the project. 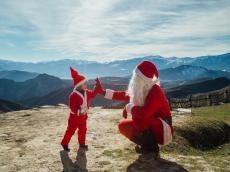 The team of Camping Azerbaijan already climbes for the fourth year to the remote areas of northern Azerbaijan, including Guba and Gusar mountain villages, in favor of their Santa Claus project. Beforehand, they collect gifts, toys and games for the children and hand them over dressed up in Santa Claus costumes. The last trip has been documented by Zaur Mirzayev, Elshan Baba and Eldar Akbarov. They captured the colorful, magical moments of joy, excitement and friendship embedded in front of the picturesque mountain landscapes. The event consists of a conversation with the operators of Camping Azerbaijan, informing about their social projects and a presentation of the photo documentation of this year’s "Santa Claus" Project. Among the speakers are representatives of Camping Azerbaijan Elvin Mammadsoy, Tural Omarov. Camping Azerbaijan is an eco-tour agency organizing weekend trips and private tours to the remotest villages, nature areas, high mountainous areas and peaks of the Caucasus. The company was established in 2014. "De/Construction" is a series of events that takes place during the de/installation period at ARTIM. It provides a platform for critical discussion, brainstorming and exchange for young creative people to share and reflect on their body of work with a broader audience.